So, I'm sure you all know about this series, but probably by their individual names. I have read the first two, and hope to start the third soon. However I would like to express my opinions on the first two and then extend the review to the third when I have read it. I don't normally read crime fiction, to be honest it doesn't interest me at all, but my goodness I am glad I picked up these books. 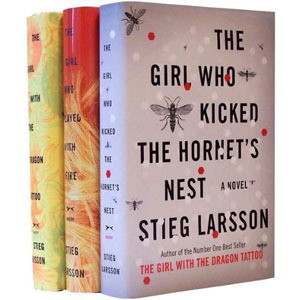 The first book explores the main characters Lisbeth Salander and Mikael Blomkvist just enough for you to be intrigued and you are definitely satisfied by the end of the book. The second book then goes further into their lives, particularly the mysterious Salander who's character and unpredictable behaviour makes her such a great character to read. It's great to read a female character that isn't basing her actions on the chance that the male protagonist will fall in love with her. Salander is who she is and will do whatever it takes to do what is right. She does not take any crap from anybody. If you pardon my French. There are some graphic moments in these books which made my stomach go all funny. I can't even watch Casualty let alone read about some horrifying crime. It didn't put me off though. I haven't seen the movie (either the Swedish or American versions!) and I don't think i will be any time soon. If I can't read the graphic scenes, how will I be watching them?? Also, in the first book, I must not have been reading carefully enough, because I totally flew past the plot twist and had to re-read a few pages when I realised what I had done. Silly. Maybe this enhanced my surprise. I don't know. I am looking forward to seeing where the characters go in the final book. I am sure there are plenty more twists and turn to come.